Have a few more minutes? Stick around because we’ve got additional details to share below. For those of you wondering how to participate in a Twitter Chat, it’s actually quite simple. The whole event is held together by the #LoveYourCRM hashtag, so if you follow that hashtag you will see tweets from all participants – and if you want to participate as well, you just include that hashtag into your own tweet so everyone else can see it too. Of course, Twitter does move pretty fast, but fortunately, there are tools that make it easier for you to participate. One of the easiest tools is TweetChat. Just go to the link on August 23rd and type in the hashtag that you want to follow (which would be #LoveYourCRM). After that, you will be directed to log into your Twitter account. You will then be taken to a room where you will see a live stream of all tweets using that hashtag. There is also a box to add your own tweets (and it automatically adds the #LoveYourCRM hashtag for you!) It’s really that simple. The Insightly Twitter Chat will be in question and answer format. Ramon will be sharing his answers to all of Insightly’s questions, but you are also welcome to answer questions and add comments. It’s a fun way to learn, share and network with your small business peers. I'm attending the @insightlyapp #SmallBiz Twitter Chat on Aug 23! Join me here. How to incentivize employees in your small business? How to effectively use social media to promote your business? How much should a small business owner invest in technology and automation? What are the most common mistakes of first-time entrepreneurs? As you can see, there will be a lot of thought-provoking questions – and your answers and comments will make the event even better. We’re sure you’ll enjoy the articles above, plus the fun that awaits you at the live Insightly Twitter Chat! 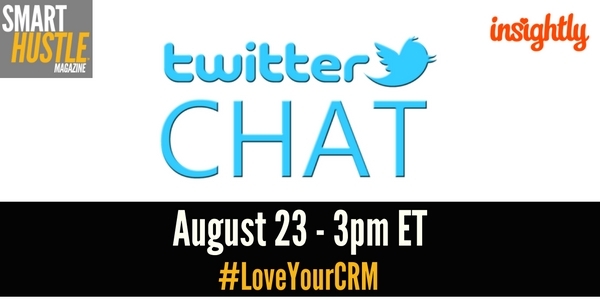 So block some time out on your calendar on August 23rd at 3pm EST and join us by following and using the #LoveYourCRM hashtag.